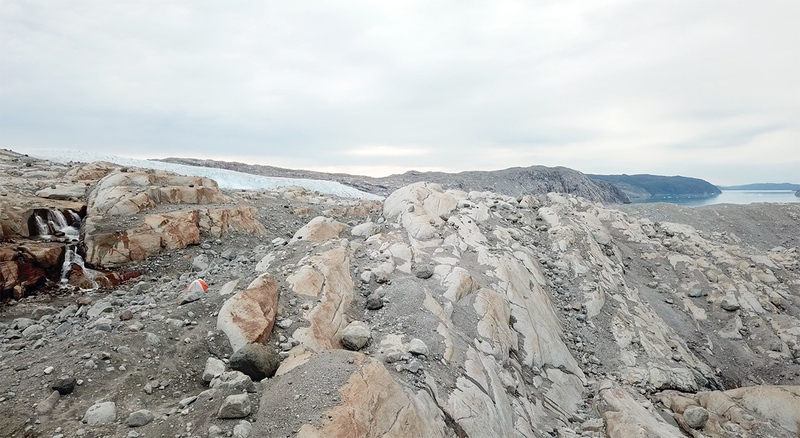 We’ve completed a major portion of Dark Snow Project’s work in Greenland for 2018. 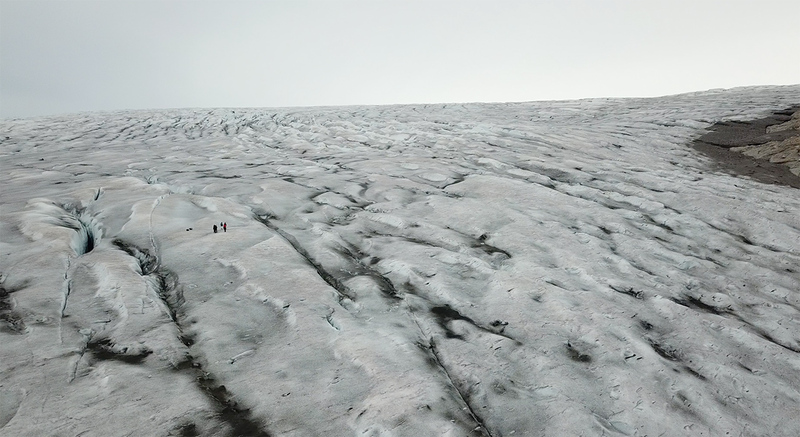 In collaboration with 350.org, Dark Snow facilitated an unlikely collaboration between poet Kathy Jetnil-Kijiner, of the Marshall Islands, and Greenlandic poet/activist Aka Morch Pederson. The basic idea was, indigenous people in the Pacific are watching vulnerable low lying atolls being eaten away by sea level rise, while indigenous Greenlanders are watching their own way of life melting away with the ice sheet that is, in turn, what is causing sea levels to rise. Ms Jetnil-Kijiner, above, collaborated with film maker Dan Lin to produce a well received video of her slam poem responding to gradual ocean rise threatening nuclear waste stored in a concrete dome following cold war weapons testing in her homeland. 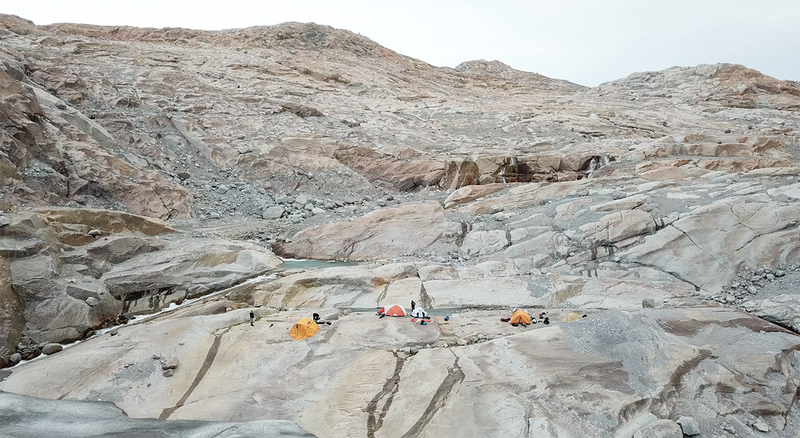 With logistics support from Dark Snow, Jetnil-Kijiner and Lin worked to create a similar piece highlighting ice melt and sea level impacts, shooting on the Southern Greenland ice sheet. Along with us on the trip was 350.org founder Bill McKibben, who gave a brief overview of the project – which will be premiered simultaneously in several international newspapers including the Guardian, on September 12. Hardest thing to believe about Greenland is how much sweating you do this close to the ice cap. Hope to have some down time in next day or so to update. Currently in Narsarsuaq in a break after the first phase of Dark Snow 2018. Draining video cards, recharging batteries, (mine and the camera’s) – backing up files. Have been here almost a week, but have to say we’d really all lost track of time. For now, these. Do click to enlarge. Misinformation from deniers spreads, well, worse than wildfire. Carbon Brief has a much needed corrective, from the always on-point Zeke Hausfather, to some nonsense denial memes that have been making the rounds, in this season of off the hook wildfires. Recently, some commentators have tried to dismiss recent increases in the areas burnt by fires in the US, claiming that fires were much worse in the early part of the century. To do this, they are ignoring clear guidance by scientists that the data should not be used to make comparisons with earlier periods. The US National Interagency Fire Center (NIFC), which maintains the database in question, tells Carbon Brief that people should not “put any stock” in numbers prior to 1960 and that comparing the modern fire area to earlier estimates is “not accurate or appropriate”. Here, Carbon Brief takes a look at the links between climate change and wildfires, both in the US and across the globe. As with any environmental issue, there are many different contributing factors, but it is clear that in the western US climate change has made – and will continue to make – fires larger and more destructive. According to data from the NIFC, there has been a clear trend in increased area burned by wildfires in the US since the 1980s, when reliable US-wide estimates based on fire situation reports from federal and state agencies became available. Today, wildfires are burning more than twice the area than in the 1980s and 1990s. These figures include all wildland fires in both forested and non-forested areas. Most of the area burned today is in the western US, where dryer conditions tend to allow for large, quickly-spreading wildfires. The black bars in the top panel of the figure below show the annual area burned (in acres) by wildfires since 1983 when reliable data became available. The blue line shows the linear trend in fires over the same period. The bottom panel shows all of the data in their database, including pre-1983 values where the data is of poorer quality. Annual wildland acres burned since reliable data was available in 1983 (top panel) and area burned since 1923 (bottom panel) showing periods when quality of data was poor and incomparable. Blue line in top panel shows linear trend. Data from the US National Interagency Fire Center; Chart by Carbon Brief using Highcharts. Air quality warnings posted in Seattle. In 2017, the United States suffered a severe fire season that included one the largest wildfire smoke events ever observed. Seattle from the air today, photo by Doug Kruhoeffer. Glaciologist Mauri Pelto tweets this picture of haze high in the Cascade Range at Columbia Glacier. It strikes me that Politico is not the normal venue one might find a well-known climate expert explaining jet stream dynamics. Indicator that this freaky summer is getting some attention? We’ve all become increasingly used to reports of extreme weather over the past few years. But this summer’s raft of dramatic weather events is significant: Not only does it show what warming can do, it points to the potential large-scale trouble that lurks in the disruption of the planet’s winds and ocean currents. In the past few months alone, we’ve seen extreme heat in Western Europe, Canada, Alaska, the western United States, Texas, Japan and Algeria, which set a new temperature record for Africa. Greece, Scandinavia, California and Siberia all suffered through drought and wildfires, while Japan, the U.S., Europe and India were hit with devastating floods. The human toll and harvest losses are still being tallied. That global warming leads to more heat extremes is not rocket science and has been confirmed by global data analysis. We’re seeing five times more monthly heat records — such as “hottest July on record in California” — now than we would in a stable climate. As part of this pattern, we can expect more heat drying out soils and causing more drought and wildfires. We also expect to see more extreme rain, given that a warmer atmosphere can take up and then release more moisture. A global increase in rainfall records has also been documented in weather station data. But there is something more interesting going on here too. It’s not just that the weather is doing what it always does, except at a higher temperature level. Rather, there is growing evidence that the dynamics of weather itself are changing. Let’s take a look at a concrete example. In my home town Potsdam, near Berlin — which boasts a high-quality weather station with uninterrupted homogeneous data since 1893 — April was the warmest April since measurements began, and May was the warmest May. Although June and July did not set any new records — those were recorded in 2003 and 2006 — they were also among the warmest. Just how extraordinary the current hot weather anomaly really is can best be seen when looking at the period between April and July. 328 Days later, electricity restored in Puerto Rico. The government of Puerto Rico says it has restored power to the last neighborhood that lost electricity after Hurricane Maria — 328 days after the Category 4 storm hit the island. The island’s embattled public utility company celebrated the moment on Twitter. “The work to restore power has been completed for our last customer; the residence of Charlie, Jazmín and their children in Bo Real Anón, Raíces sector, Ponce; thank you,” the company said Tuesday in a Twitter post, which included a photo of the lucky (or unlucky) family who was last to get electricity. Former White House aide Omarosa Manigault Newman says in her new book that White House chief of staff John Kelly shut down her attempts to get aid for Puerto Rico after it was devastated by Hurricane Maria — and he accused the island government of trying to exploit the tragedy to get money from Washington. She also writes that Kelly and President Donald Trump “referred to Puerto Ricans with derogatory terms many times.” Manigault Newman did not say specifically what those terms were. Manigault Newman described the administration’s response to Puerto Rico — after the hurricane took out its electrical grid, left residents without food, water or housing and killed many — as lethargic and contrasted it with the White House’s aid to Florida and Texas when those states were hit by hurricanes Irma and Harvey. In a meeting, Kelly blamed the crisis on Puerto Rico’s “already screwed-up” infrastructure, she wrote in “Unhinged: An Insider’s Account of the Trump White House,” which was released Tuesday. Kelly suggested that Puerto Rico’s government, near bankruptcy, “was trying to exploit the hurricane to focus on the United States to foot the bill to rebuild their electrical grid,” she continued.